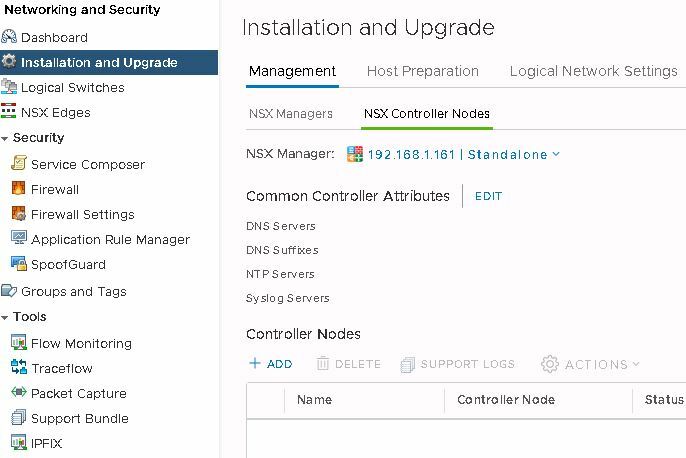 In my previous post I have shared the Requirements For NSX Data Center For vSphere Deployment and here I will cover the cluster preparation , Controller deployment steps . I have already shared the details about Controller in NSX Data Center for vSphere Overview post , so not going to explain here again and we will go for deployment steps. 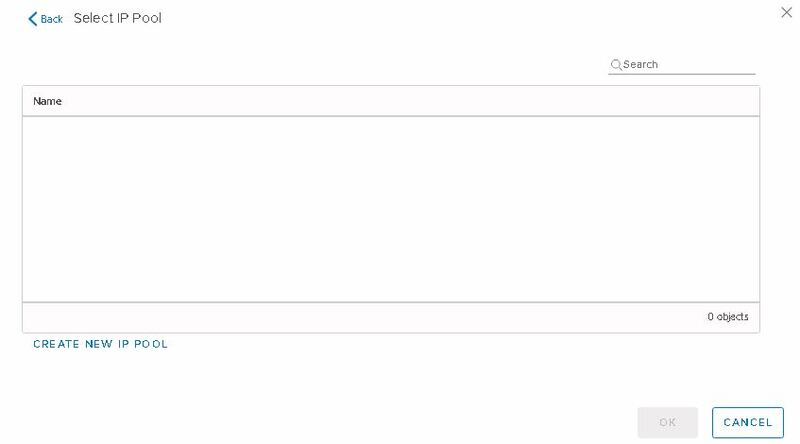 Login to vCenter web client and Navigate to Network and security. Note :- Password must not contain the username as a substring. Any character must not consecutively repeat three or more times. 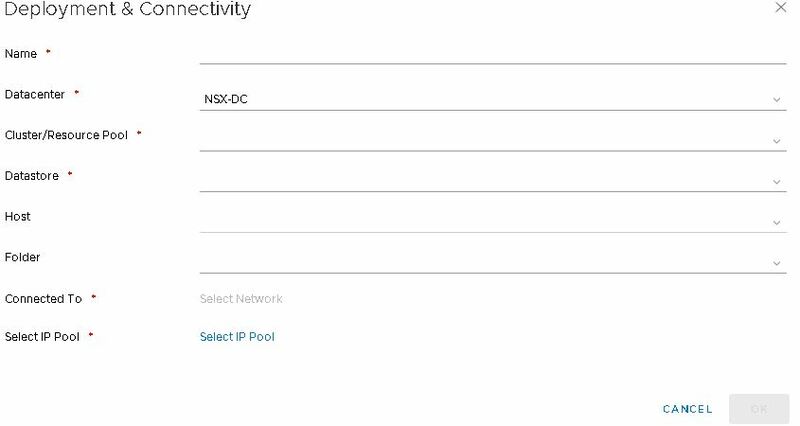 You have to provide the NSX Controller settings appropriate for your environment. from residing on the same host , and for lab purpose one controller is sufficient. Controller is deployed as a OVF method and its required min 30 GB free space and 8 GB RAM and 2 CPU resource available. Once Controller is deployed you can see it shows connected . 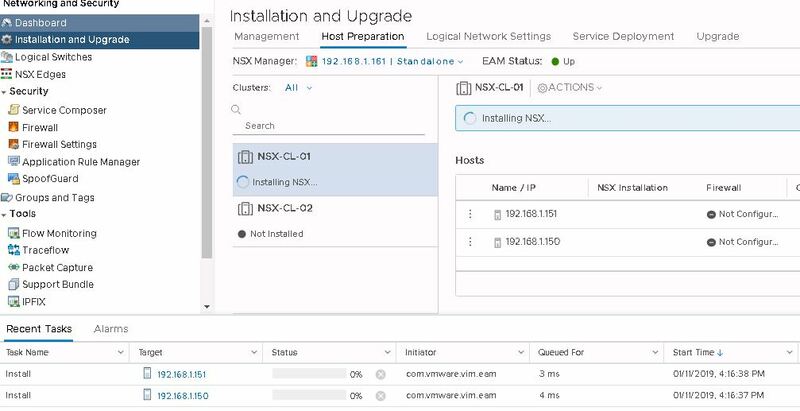 Navigate to Network and security –> Installation and upgrade –> Host preparation -> select the cluster and click Install . Once hosts preparation is completed you can see the version on NSX and firewall is enabled and Communication channel status shows up. VIBs are installed and registered with all hosts within the prepared cluster and you can verify relevant VIBs installed by running below command on ESXi host . 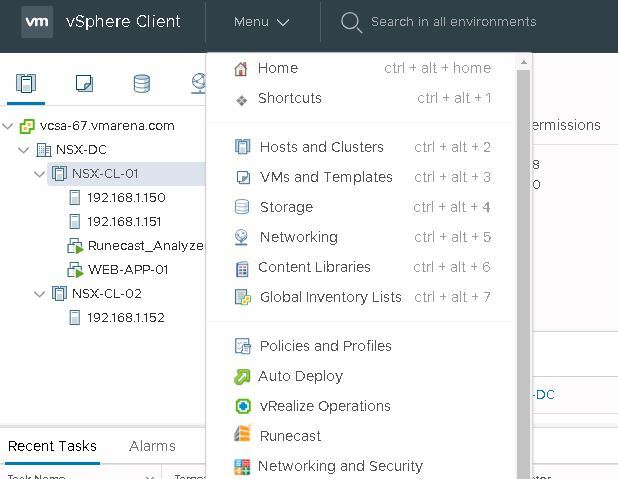 Note :- If you add a new host to a prepared cluster, the NSX Data Center for vSphere VIBs will automatically get installed on the host and if you move a host to an unprepared cluster, the NSX Data Center for vSphere VIBs are automatically uninstalled from the host. Note:- MTU as minimum 1600 or more based on your network switches configuration. 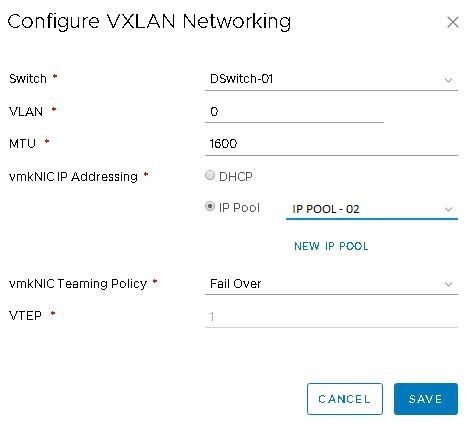 Configuring VXLAN results in the creation of a new distributed port group in the specified vSphere Distributed Switch, you can check from Network Options . VXLAN segments are built between VXLAN tunnel end points (VTEPs). Each VXLAN tunnel has a segment ID. You must specify a segment ID pool for each NSX Manager to isolate your network traffic. 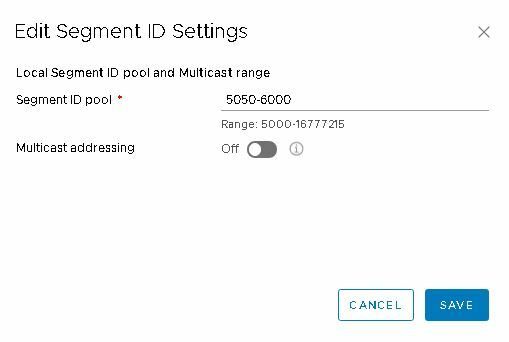 To configure the segment ID’s Navigate to Networking & Security > Installation and Upgrade >Logical Network Settings and In segment ID pool settings select edit and provide a range for segment IDs, such as 5050-6000 and Click Save . When you configure logical switches, each logical switch receives a segment ID from the pool. Note:- If any of your transport zones use multicast or hybrid replication mode, you must add a multicast address or a range of multicast addresses and this is optional. Select or turn on the Enable Multicast addressing feature. Enter a multicast address or multicast address range, such as 239.0.0.0-239.255.255.255.
requirements. A host cluster can belong to multiple transport zones. A logical switch can belong to only one transport zone. NSX Data Center for vSphere does not allow connection of VMs that are in different transport zones. The span of a logical switch is limited to a transport zone, so virtual machines in different transport zones cannot be on the same Layer 2 network. A distributed logical router cannot connect to logical switches that are in different transport zones. After you connect the first logical switch, the selection of further logical switches is limited to those that are in the same transport zone. Similarly, an edge services gateway (ESG) has access to logical switches from only one transport zone . Click Transport Zones and then click Add. 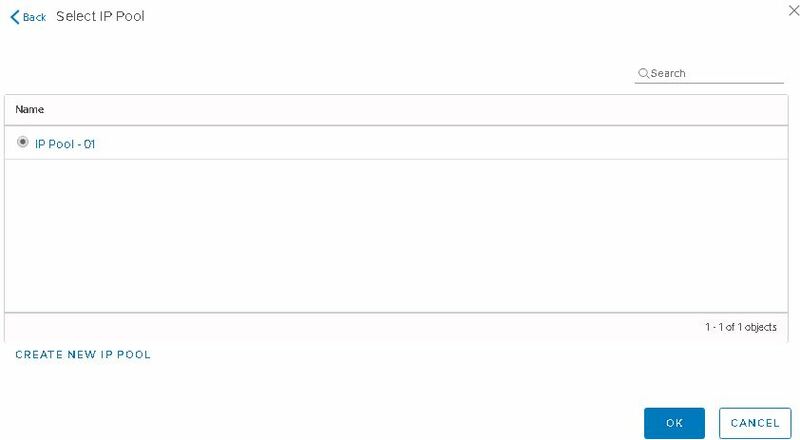 Enter the New Transport Zone a name and an optional description and depending on the requirement select the replication mode , in our case we use Unicast . 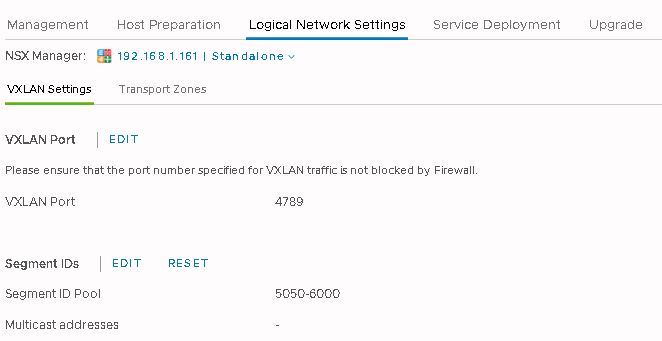 Multicast: Multicast IP addresses in the physical network are used for the control plane.This mode is recommended only when you are upgrading from older VXLAN deployments. Requires PIM/IGMP in the physical network. Unicast: The control plane is handled by an NSX Controller. All unicast traffic leverages optimized head-end replication. No multicast IP addresses or special network configuration is required.